Our first stop in what I’ve just now decided to call Measure and Stir’s Magical Mixological Journey in the Land of the Rising Sun(tm) was Gen Yamamoto in Azabu-Juban. For those of you who followed the link to the serious eats article, it was the only one they visited that is worth your time. Gen opens his bar at three pm, and we were the first to be seated. Immediately as I walked in, I was struck by the simple elegance and minimalism of the place. The walls are bare, and the only decoration is the beautiful wooden bar counter, which is made of only two pieces of wood cut vertically from a single tree. There are exactly eight seats, all at the bar. Side note: Huge thanks to ulteriorepicure for letting me use some of his beautiful pictures for this post. You can see the full set of his pics on Flickr, it’s definitely worth a look. It is easy to tell which pictures are his because they are the ones that are well-lit and composed. The menu at Gen lists only six drinks, which can be ordered a la carte, or as a four or six drink tasting menu. We opted to taste all six, of course. Gen’s drink-making philosophy really exemplifies my understanding of the Japanese approach to cuisine, which is to create flavors that are light, subtle, and thoughtful. The tasting course reflects “shiki”, Japanese seasonality, using fresh ingredients while building on a progression of flavors and harmony. The order of the courses was also smartly chosen, which each drink flowing nicely into the next. We started with a highball of gin, club soda, spices, and a house-made syrup of Kochi golden ginger. This was the most complicated drink in terms of flavor, because the spice syrup contained ginger, coriander, lemon grass, and clove, among other flavors. I apologize, but I cannot remember the exact nature of the second drink. I think it used sake, yuzu from Chiba, and a green herb. The fourth was made with vodka and muddled kiwi from Shizuoka Koryoku. In the past I have never cared for vodka, but it’s light and clean flavor is well-suited to Gen’s style, and this trip really helped me to discover its uses. 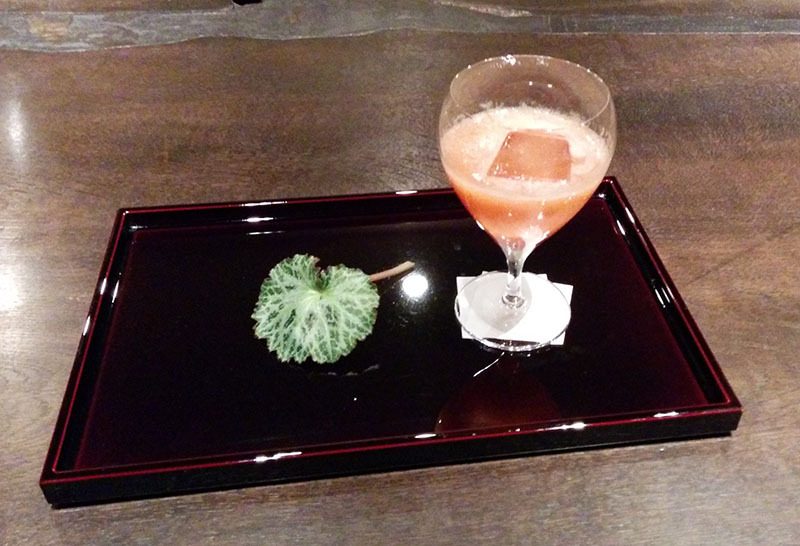 The fifth was a bloody Mary using an heirloom tomato grown by the Shizuoka Ishiyama family. Apparently it grows in winter. It was unusually sweet and fruity. The flavor of the fresh tomato was beautifully paired with a “rye vodka” (or an unaged rye??) and shiso leaf. This drink was truly spectacular. 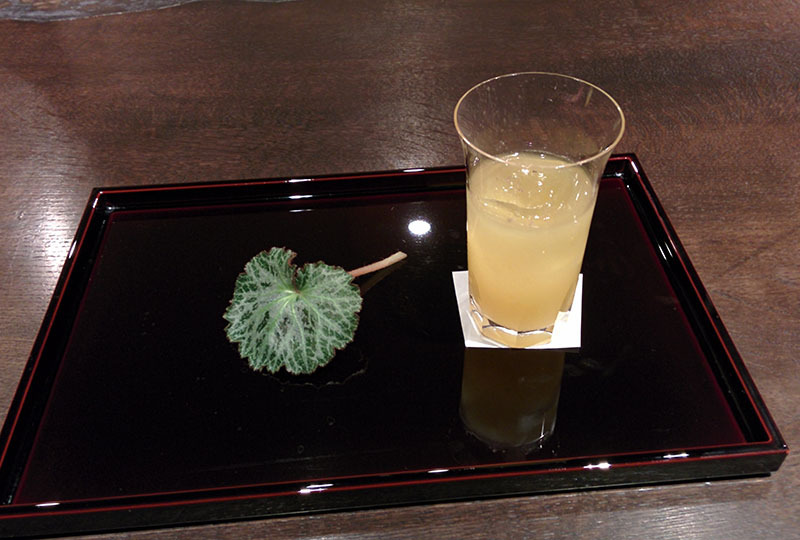 We ended with a drink made of white kabocha (japanese pumpkin) from Chiba and a touch of cream. I shamelessly appropriated the above photo of it from DrTomostyle‘s twitter. After touring through so many bars in Tokyo, I can say with confidence that this is one of the best. If you are anywhere near Azabu-Juban, it is not to be missed. Be warned, though, that it is a patient, contemplative experience. If you’re just looking for a quick drink, it’s probably not the place to go. 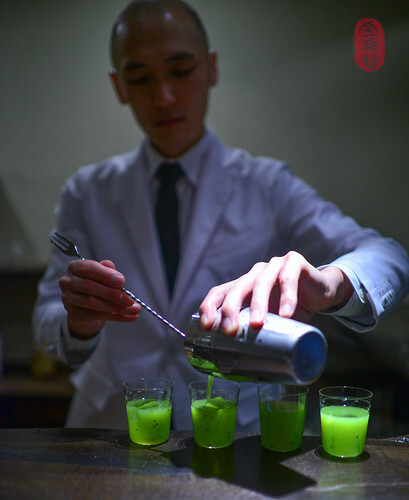 If you are looking for an elevated experience of Japanese mixology, however, you can’t afford to miss it. Categories: excursions | Tags: alcohol, bars, bartending, booze, cocktail, cocktails, craft cocktails, drinking, drinks, japan, liquor, mixed drinks, mixology, seasonal, shiki, tokyo, travel | Permalink. Excellent: the theme of your research, the lengths you go, and providing highly illustrated and explained findings. This may sound funny, but domo arigato for going to Japan to write about the land’s barkeeps. Looking forward to your next post. Absolutely loved this place. Highlight for me was a passion fruit/suntory whisky cocktail.